What Day Of The Week Is October 2? 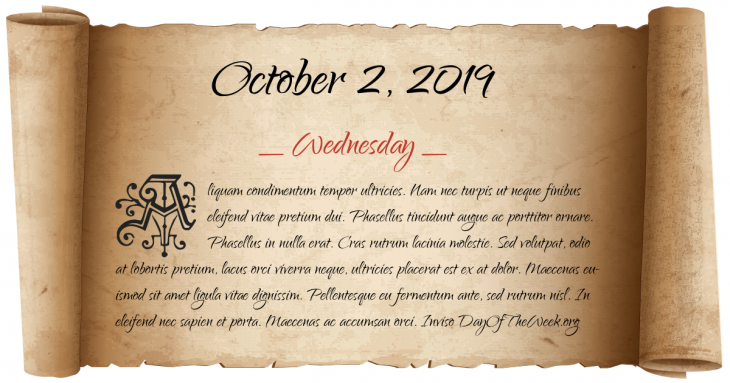 October 2, 2019 is the 275th day of the year 2019 in the Gregorian calendar. There are 90 days remaining until the end of the year. The day of the week is Wednesday. Battle of Rancagua: Spanish Royalists troops under Mariano Osorio defeated rebel Chilean forces of Bernardo O'Higgins and Jose Miguel Carrera. American Civil War: Battle of Saltville – Union forces attack Saltville, Virginia, but are defeated by Confederate troops. Guinea declares its independence from France. The Carandiru Massacre takes place after a riot in the Carandiru Penitentiary in São Paulo, Brazil. Aeroperú Flight 603, a Boeing 757, crashes into the Pacific Ocean shortly after takeoff from Lima, Peru, killing 70.
Who were born on October 2?